Are more aggressive efforts needed to protect children? Since the mid-1990s, the world has watched in horror as hundreds of thousands of children and young teenagers have participated in nearly 50 wars, mostly in Africa and Asia. Children as young as 5 or 6 have served in combat, and thousands of abducted young girls were forced into sexual slavery. Some terrorist groups even strap explosive-rigged vests onto children and send them off as suicide bombers. Others have been recruited, sometimes forcibly, into the official armed forces or paramilitary units of several dozen countries. 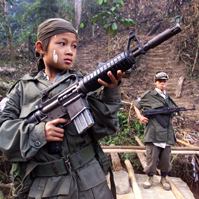 U.N. treaties prohibit the use of child soldiers, and the Security Council "names and shames" persistent violators. But only four former guerrilla commanders have been convicted by international tribunals, and some human-rights advocates urge more aggressive prosecution of perpetrators. However, some peace negotiators say threats of prosecution can obstruct cease-fire negotiations and prolong the fighting. In the U.S., where children under 18 serve in the military in non-combat roles, Congress is considering laws to combat the use of child soldiers overseas.